Three priests for the Archdiocese of Dubuque are celebrating 60 years since ordination this year. Fathers John O’Connor, George Karnik and John Dalton were ordained on Feb. 1, 1958. Read about their ministries below. 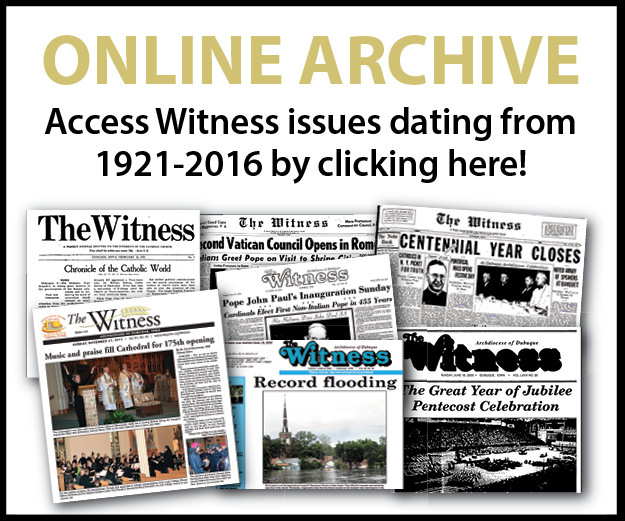 The Witness will be featuring other priest jubilees later in the year. Father John J. O’Connor was born March 21, 1933, at Dougherty, Iowa, to Everett and Mary Bertha (Merfeld) O’Connor. He graduated from Loras College and had his theological training at Mount St. Bernard Seminary, both in Dubuque. On Feb. 1, 1958, he was ordained at St. Raphael Cathedral in Dubuque by Archbishop Leo Binz. He served as an assistant pastor at St. Anthony Parish, Dubuque, 1958-63, and Immaculate Conception Parish, Cedar Rapids, 1963-68. He was appointed to the teaching staff of Wahlert Catholic High School, Dubuque, 1960-63 and 1968-84. 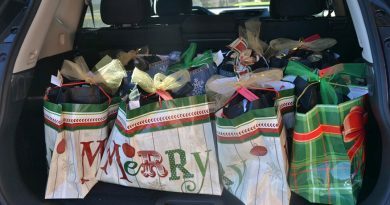 During this time, he also served as dean of discipline, director of development, and had care of the physical plants at Wahlert, Regina Convent and Vianney House. From 1984-88, he was director of development for the Archdiocesan Office of Catholic Education. Father O’Connor was appointed pastor of St. John Parish, Placid, 1985-88, and St. Joseph Parish, Key West, 1988-96. He was the pastor of the parishes of St. Boniface, New Vienna, and SS. Peter & Paul, Petersburg, from 1996 through 2017. On Jan. 1, 2018, he became the sacramental priest for these two parishes and will serve in this role until his retirement in July. Father O’Connor will celebrate his 60th jubilee with a social on Saturday, Feb. 3, in the church basement in New Vienna following the 7 p.m. Mass and with a second social on Sunday, Feb. 4, in the school gym in Petersburg after the 10 a.m. Mass. 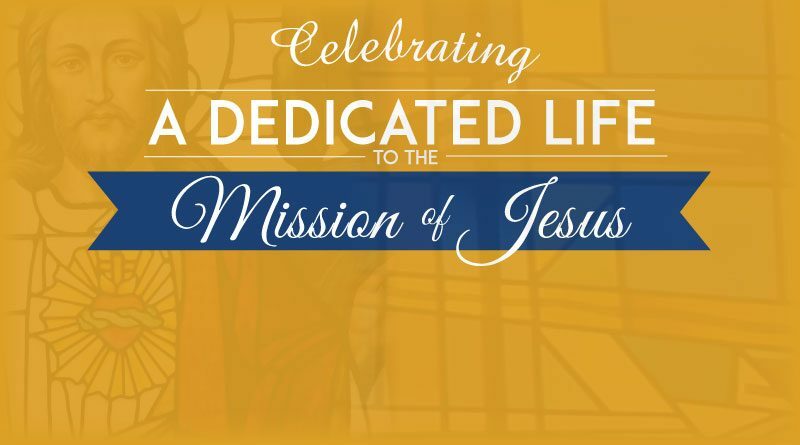 Father George Karnik, one of the founders of the Christian Experience Weekend (CEW) program, is celebrating 60 years of being a priest this year. Father Karnik was born on a farm near Fort Atkinson on July 4, 1932, to Anton and Mary (Ryant) Karnik, the youngest of eight children. He attended St. John Nepomucene Ele­mentary School there, then graduated from Loras Academy, Dubuque. After graduation from Loras College in 1954, he completed his theological studies at Mount St. Bernard Seminary, Dubuque. He was ordained Feb. 1, 1958, by Archbishop Leo Binz at St. Raphael Cathedral. 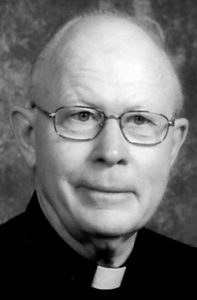 His first assignment was as associate pastor of St. Edward Parish and faculty member at Columbus High School, both in Waterloo, 1959-63. In 1963, he was assigned to Holy Trinity Parish and Rudolphinum High School, both in Protivin, and Holy Cross Parish in Schley. When the high school closed in 1968, he was appointed the first director of St. Paul School of Religion in Manchester, also assisting at St. Mary Parish in Manchester and St. Patrick Parish in Ryan until 1977. With Msgr. Joseph O’Brien and Sister Carole Freking, OSF, he developed the Christian Experience Weekend (CEW) format. Since the first weekends were held in 1974, the program has spread to several states. The third edition of the CEW manual, which was recently published by the Archdiocese of Dubuque, is now available from the Office of Adult Faith at the Archdiocesan Pastoral Center. While serving as director of family life for the archdiocese, 1977-85, he resided at Holy Ghost Parish in Dubuque, assisting with Masses there when not working on Marriage and Engaged Encounter Week-ends or CEWs. In 1985, Father Karnik was appointed to team ministry at St. John Parish in Waterloo and St. Nicholas Parish in Evansdale. 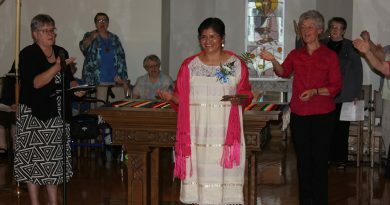 Upon the team’s dissolution in 1987, he was appointed pastor of St. John’s and, in 1999, also pastor of St. Nicholas. Since retiring in 2002, he has lived in Evansdale, remaining active in CEW, prison ministry and filling in at Waterloo/­Cedar Falls parishes as needed. There will be a celebration for Father Karnik’s 60th jubilee on June 10 at Queen of Peace Church, Waterloo, at 10:30 a.m. It will be followed by a full meal in the church dining room. This is not a parish Mass, but a separate Mass, between the parish’s 9 a.m. and 12 p.m. Masses. Father Karnik would like to invite everyone to attend the Discipleship through Social Justice Weekend, April 27-29, at the American Martyrs Retreat House outside of Cedar Falls. For additional information of this retreat, call 319-226-5412 or email: gwk19702@cedarnet.org. Msgr. John Dalton has covered a lot of ground during his priesthood, at one point traveling the world to observe Catholic Relief Service projects in many countries. Nevertheless, he still has a fondness for the first leg of his 60-year journey in ministry, which began while he served as an associate pastor at St. Joseph Parish in Farley. Msgr. Dalton of Naperville, Illinois, was born June 9, 1923, the son of James J. and Margaret (Carmody) Dalton. Following three years of military service during World War II, he returned to DePaul University in Chicago, graduating with a degree in marketing in 1950. 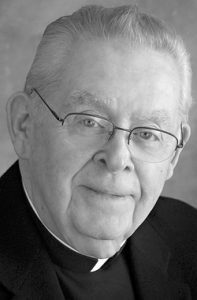 Employed by the Archdiocese of Chicago for three years as a cemetery counselor, he began his studies for the priesthood at Loras College in Dubuque in 1953. He was ordained for the Archdiocese of Dubuque on Feb. 1, 1958, by Archbishop Leo Binz at St. Raphael Cathedral. 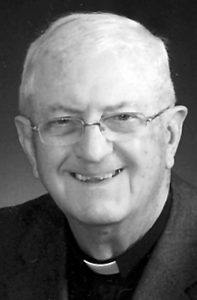 His first appointment was as associate pastor of St. Joseph Parish in Farley, 1958-63. Beginning in 1963, he served as archdiocesan vice-chancellor, secretary, and master of ceremonies to Archbishop James J. Byrne for 16 years. In 1969, he was appointed archdiocesan director of cemeteries and later served as president of the National Catholic Cemetery Conference. In 1975, he was named to the Archdio­cesan Administrative Council. He was designated archdiocesan director of the Campaign for Human Development and archdiocesan director of Catholic Relief Services (CRS). He was designated by the National Committee of CRS to observe projects funded by CRS in Southeast Asia, covering the Philippines, Vietnam, Thailand and India. In 1984, he served as chairman of the newly established Archdiocesan Worship Commission. In the same year, he served as moderator of the Archdiocesan Council of Catholic Women, also serving on the Archdiocesan Building Committee. He served as chaplain of the BVM Marian Hall Infirmary, 1973-79. He was pastor of St. Patrick Parish in Cedar Rapids, 1979-82, and rector of St. Raphael Cathedral in Dubuque, 1982-93, undertaking renovation of the cathedral in 1986. He served on the Clarke College Board of Trustees, 1981-2005, and was honored with the Degree of Doctor of Humanities (Honoris Causa) in 1993, the year he retired from active ministry. Since retiring, he has been associated with the Diocese of Joliet, Illinois, where he moved to be closer to family, according to the priest.